Hyundai and Tata are one of the best automobile companies in the category of compact hatchbacks. They both have proved to be good in the market and have got nearly equal positive responses from the buyers and the people. While the best-selling model for Hyundai has been the Hyundai Santro, the car that turned the fortunes of Tata Motors around is Tata Tiago. Now, in order to decide which one of these hatchbacks is the best in the category, lets have a look at their features and specifications. The Hyundai Santro uses a 1.1L 4-cylinder engine. The fuel tank capacity is 35 litres. It offers a displacement of about 1086 cubic centimetres. The TATA Tiago uses a 1.2 L 3-cylinder Revotron engine. The displacement offered by the engine is 1199 cubic centimetres. Both the engines use petrol as the fuel. The Hyundai Santro reaches the speed of 100 kilometres per hour in 12.8 seconds. The fuel economy offered by the car is around 20.3 kilometres per litre. This is a good average. Its top speed is 150 kilometres per hour. The TATA Tiago falls back in this category. The car reaches a 100 kilometres per hour speed in 14.2 seconds. The fuel economy of the Tiago is about 23.84 kilometres per hour. The design of Hyundai Santro is derived from its older version. It fails to be original. It is not bad, but the original design is more appreciated. The design of the TATA Tiago is truly original. It is also trendy-looking. The design of the car appeals to the buyers and thus, it has been a favourite in the wide range of automobiles offered by the company TATA. 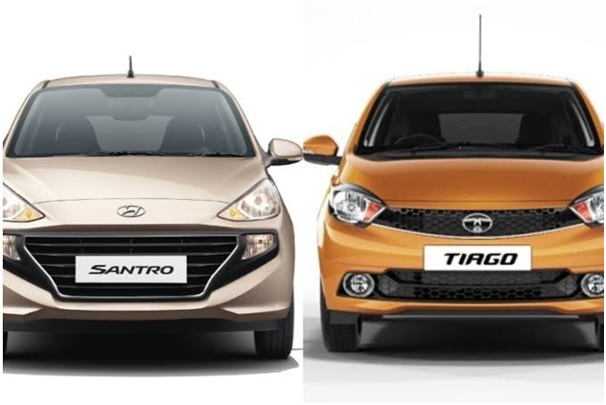 From the dimensions we can clearly see that TATA Tiago is slightly longer than the Hyundai Santro. This is justified by the larger leg space offered by the TATA Tiago. The price of the top-model of Hyundai Santro is about 8.68 lakh rupees on road, whereas that of TATA Tiago is 7.64 lakh rupees. Thus, TATA Tiago is a cheaper car than the Hyundai Santro. 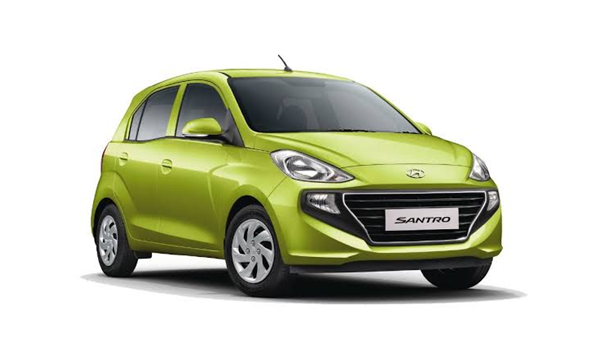 The Hyundai Santro is available in the colors Star dust, fiery red, typhoon silver, blue, polar white and flame orange. The TATA Tiago is available in Berry Red. Pearlescent white, ocean blue, expresso brown, titanium grey, canyon orange, platinum silver. 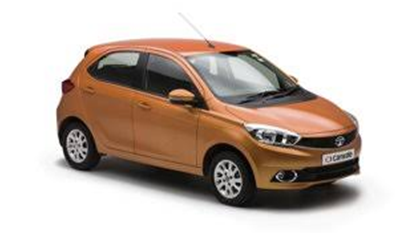 Thus, TATA Tiago give more variety of colours for the cars to the people. The discussion is endless. But it is very clear that the TATA Tiago is a better option than Hyundai Santro.